This superb example of an Azimut 46 offers a full width master cabin and two additional en-suite guest rooms. Exceptional main salon with large aft deck. Full air-conditioning. Many toys. and two twin guest cabins. 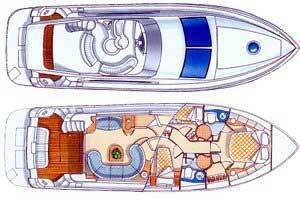 Luxurious salon with galley, well equipped, fully air - conditioned.